It also has a more pleasant operating environment due to renovated software. It is a state-of-the-art TOF-SIMS with wide variety of options to choose from depending on the customer’s application. Triple focusing electrostatic analyzer (TRIFT analyzer) simultaneously achieves high mass resolution and extreme sensitivity with its broad energy band-pass and large solid angle. Deep depth of focus exceeding 100 μm enables to obtain clear images with minimizing effects of surface roughness. 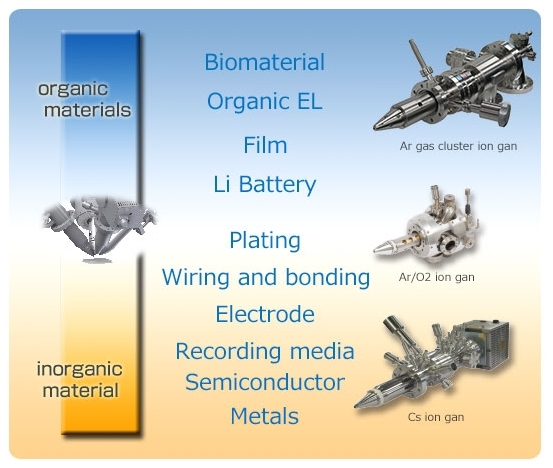 Ion source can be selected from gallium, gold, and bismuth. 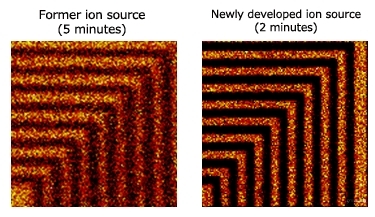 The newly developed pulsed ion source enables a minimum spatial resolution of 70 nm or less. The newly designed bunching mechanism simultaneously increases sensitivity, spatial resolution, and mass resolution performance. 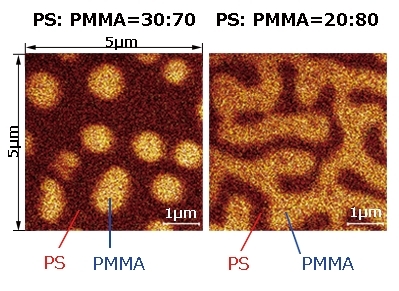 The figure on the left shows observation results of a polymer blends of PS/PMMA obtained in high spatial resolution mode. The structure of polymer blends as a molecular distribution can be revealed by nanoTOF II, which was traditionally observed by AFM. 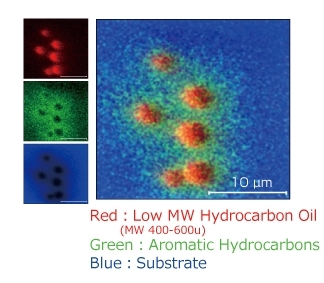 The figure on the left shows an example of separation and detection of two different types of organic matter existing on the organic material substrate. It can be confirmed that aromatic series hydrocarbons are distributed around low molecular-weight hydrocarbons in the center. 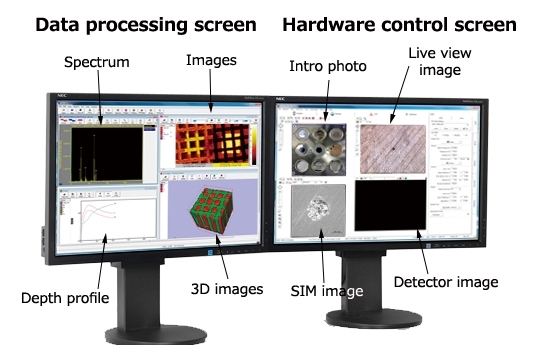 PHI nanoTOF II can simultaneously support high sensitivity, high spatial resolution, and high mass resolution without limiting the measured mass range, thus offering sharper molecular imaging. 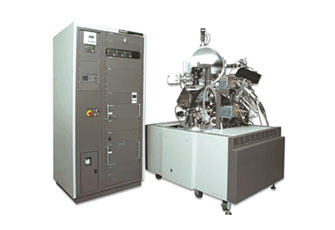 Powerful high density low energy cesium ion source provides high depth profile resolution. Along with high depth resolution, the measurement throughput has been significantly improved. Minimum ion energy of 250 eV or less is available. 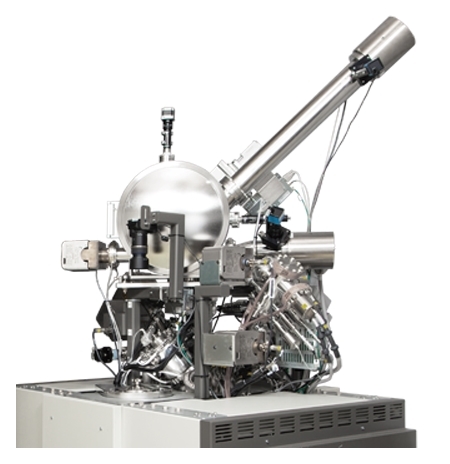 High density and fine cesium ion beam even at low energy provides wide range of applications with practical ion sputtering speed. 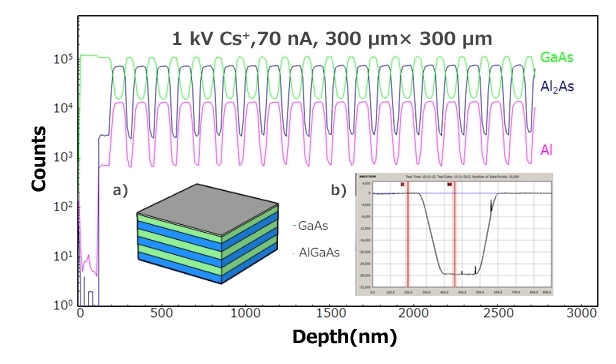 The figure below shows results from a GaAs/AlGaAs superlattice depth profile analysis. (In the figure a) Sample diagram, b) Results taken by surface profiler. Depth resolution does not degrade even at a depth of approximately 3 μm and it allows accurate observation of the layer structure. Depth resolution does not degrade even at a depth of approximately 3 μm and it allows accurate observation of the layer structure. SmartSoft-TOF was employed which has previously established a popular reputation as software for our XPS instrument (x-ray photoelectron spectrometer) and AES instrument (Auger electron spectrometer), while maintaining the high operability with a traditional dual screen, Graphical User Interface (GUI) of SmartSoft among TOF, XPS and AES employs a common architecture, and users can operate without uncomfortable feeling even among different techniques. Both of a cover shot of a sample platen taken by the introduction camera and more high resolution image taken by the live-view camera of the analysis chamber can guide measurement point or area precisely. 100 mm square sample platen is as standard. Two type of standard platens which are a front mount and back mount platen can be chosen depending on application. Sample cooling/heating can work even in operation, not only during sample sample mounting at the sample introduction, but also during moving stage. 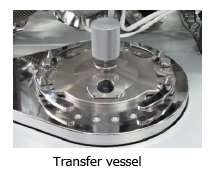 Transfer vessel, for instance, can work between the customer’s glove box and the nanoTOF II introduction chamber without being exposed into air. Air sensitive samples such as lithium battery or fuel cell are most appropriate. The nanoTOF II is providing patented charge neutralization technique, which is directing very low energy electrons and argon ions to an insulating sample simultaneously. This turnkey neutralization technique realizes stable analysis even with high insulating samples. The parallel imaging MS/MS option enables simultaneous acquisition of mass spectra and mass images at the exact same analysis area since the secondary ions are generated by a single primary ion source. With high speed (over 8 kHz) and high mass accuracy (below 20 ppm), spectra and images of both MS1 (normal TOF-SIMS analysis) and MS2 (MS/MS option) are generated in a few minutes under static SIMS conditions. In some fields, using only the current MS1 spectra and images were insufficient for analyzing chemical structures, but this new MS2 (MS/MS option) is expected to improve this issue dramatically.